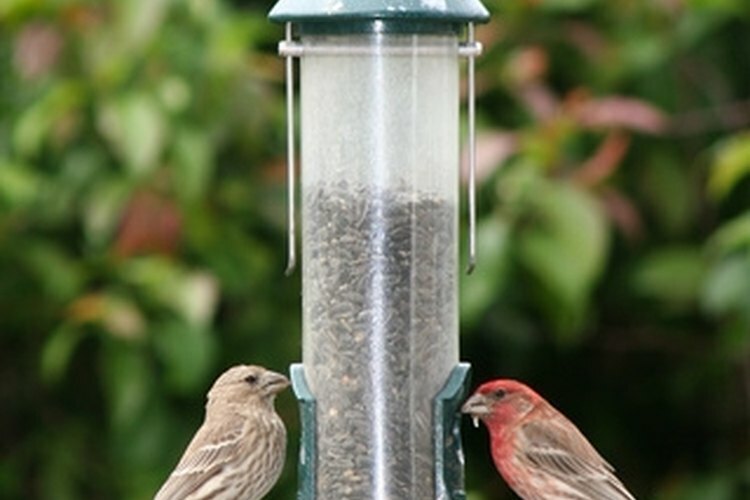 The purple finch is a finch species found in California. The finch family has significant representation in California, with various species of this bird occurring in the state. Some of the finches that inhabit California have a wide geographic range across the rest of the nation, such as the purple finch. Others however live in a much smaller area of the nation, and include California among their haunts. The purple finch is a bird that lives in most of California with the exception of the desert biome of the southwestern portions. The purple finch has a poor name, as its color is more pinkish than purple, according to the Shaw Creek Bird Supply website. The purple finch is a full-time dweller in most of the state. The bird utilizes its bill to crunch seeds to get at the inner parts. Purple finches occasionally will "steal" notes from the songs of other birds, such as towhees and swallows. The gray-crowned rosy finch lives in the mountainous terrain of northeast and eastern California, as well as the Rockies and into Canada and Alaska. This finch nests in remote areas. As a result, scientists know little about the nesting habits of the species. The gray-crowned rosy finch eats insects and seeds, often picking up bugs trapped in the snow of glaciers where it exists. The gray-crowned rosy finch can reach lengths of 8.3 inches, according to the Cornell Lab of Ornithology website. The bird has little trepidation when it comes to people because it typically has limited contact with humans. Cassin's finch resembles the purple finch in its raspberrylike coloring. The bird is common in California's mountains. The Cassin's finch will form loose colonies as they mate, with their nests located an average of about 82 feet from each other. The bird prefers coniferous forests. The Cassin's finch survives on its diet of berries, seeds, buds and bugs. The finch typically forages along the ground seeking food. The Cassin's finch is another finch that will imitate the calls and singing of other kinds of birds. The lesser goldfinch males that live in California have a greenish back and a black "cap" on the crown of the head. Those in the eastern sections of the bird's range, which includes western Texas, have blackish backs and necks. The lesser goldfinch is a full-time resident along the coastal portions of California, and many spend the summer months in the mountains of places such as Yosemite National Park. The lesser goldfinch has a diet of dandelion seeds. The bird will try to time its breeding to have the young hatch when seeds are plentiful.